This soup must be one the easiest to make and a total fool proof recipe. It is a good way to recycle left-over cooked rice or chicken to create a wholesome meal for the iftar table. This soup exists in many countries around the world and I have savoured it in many different forms with different meats, herbs and spices. I love adding the cinnamon and dried lime as it provides a balance between sour and sweet that I guarantee will bring a smile to your face. The beauty of this recipe is that with following my notes below you can have a dinner ready in 20 minutes, great when you are running against the clock. * Boil the chicken skimming impurities that rise to the surface (the foam) then add the whole onion and bay leaf, peppercorns, cinnamon, salt and dried lime, and leave to boil covered for 40 minutes or until it is cooked through. You should have 2 liters stock at the end, if less just top up with water. 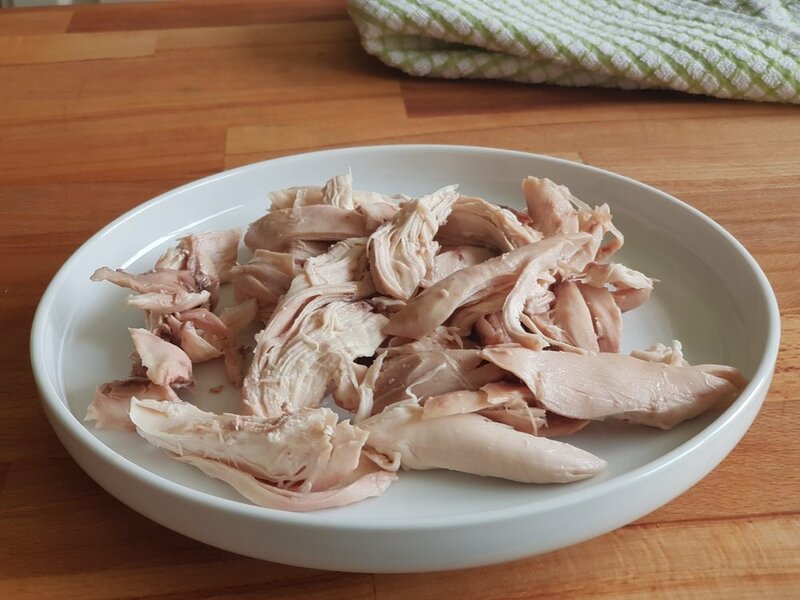 * Remove the skin and bones then shred the chicken meat into medium size shreds. * To peel the tomato simply place it in boiling water and leave it to cool down as seen in picture. * Sauté the chopped onions and carrots in the pot for a couple minutes. * Add the tomato paste and chopped tomato and sauté for a further minute. * Add the chicken stock and let it boil until the carrots are cooked around 10 to 15 minutes, then add the cooked rice and boil a further 5 minutes. If the stock has reduced a lot just top up with water and adjust the seasoning. * Add the chicken and boil for 2 minutes just to heat up the chicken. * Add chopped parsley and serve. * This recipe can be replicated using lamb or beef. * Using minced meat and bouillon stock is a way to have the soup ready in 20 minutes. * For a vegetarian option omit the meat and use a vegetable bouillon adding more varieties of vegetables. Per Serving : 339 Calories; 18g Fat (47.4% calories from fat); 19g Protein; 26g Carbohydrate; 3g Dietary Fiber; 82mg Cholesterol; 401mg Sodium.